The Exercise-Induced Bronchoconstriction GUIDELINES Pocket Guide is endorsed by the American Academy of Allergy, Asthma & Immunology (AAAAI) and the American College of Allergy, Asthma & Immunology (ACAAI) and is based on the latest AAAAI and ACAAI guidelines. 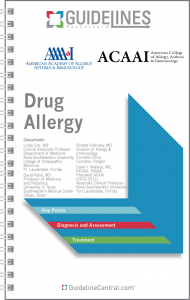 This practical quick-reference tool contains differential diagnosis, a detailed evaluation algorithm, treatment recommendations, advice for athletes, drug therapy and dosing information. The major trigger for bronchoconstriction in a vulnerable subject is either water loss during periods of high ventilation or the addition of an osmotically active agent. Exercise itself is not needed to cause bronchoconstriction, just the creation of a hyperosmolar environment. The hyperosmolar environment leads to mast cell degranulation with release of mediators, predominately leukotrienes, but also including histamine, tryptase, and prostaglandins. In addition, eosinophils can also be activated, producing further mediators, including leukotrienes. The water content of the inspired air, the level achieved and maintained during exercise, or both are the major determinants of exercise-induced bronchoconstriction (EIB). EIB is frequently documented with asthma and reflects insufficient control of underlying asthma. Elite athletes have a higher prevalence of EIB than seen in the general population, varying with the intensity of exercise and the environment.